In its first deep dive into the U.S. programmatic display ad marketplace, market research company eMarketer estimates that programmatic spend in display advertising will top $10 billion this year, rising to over $20 billion by 2016. By eclipsing $10 billion in 2014, eMarketer says programmatic will account for 45% of total U.S. digital display ad spend this year. That would represent ad spend growth of 137.1% year-over-year. 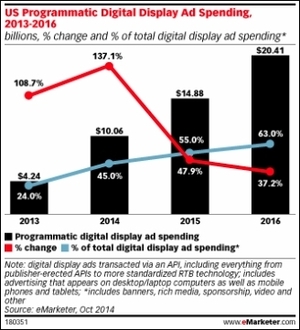 eMarketer expects spend to increase by 47.9% in 2015 -- with programmatic representing 55% of the total display ad market -- before reaching $20.41 billion in 2016, which the company estimates would be 63% of all U.S. digital display ad spend. eMarketer attributes the expected rise to over $20 billion in spend by 2016 to the rapid adoption of private marketplaces and programmatic direct deals. The company also cites the “continued maturation” in both mobile and video advertising. In short, the programmatic marketplace as a whole is maturing -- and is expected to continue to mature -- to include higher-quality inventory and new ad formats. eMarketer notes that programmatic's story can’t be told without including mobile, which will account for nearly half (44.1%) of all U.S. programmatic display ad spending in 2014 ($4.44 billion). The research firm says programmatic spend in mobile will surpass desktop spend by 2015, accounting for 56.2% of all programmatic display spend next year. Despite the aforementioned rise of “programmatic direct” trading methods -- which is a hybrid model between traditional “direct” deals and new “automated” deals -- real-time bidding (RTB) is still driving the majority of growth, per eMarketer, at least for now. The company says that RTB auctions will account for 92% of all programmatic ad dollars in 2014, or $9.25 billion. The remaining 8% belongs to programmatic direct, but eMarketer is projecting a rapid shift toward this model. The research firm expects programmatic direct to account for 42% of the U.S. programmatic market by 2016, or $8.57 billion. Open RTB exchanges still account for the vast majority (90%, or $8.14 billion) of RTB ad spend, with private marketplaces accounting for the other 10%. However, eMarketer projects open RTB spend to “remain essentially flat,” while private exchanges will grow to $3.31 billion (up from about $900 million in 2014). So what does it all mean for marketers? Fisher said that first and foremost, the projections mean automation isn’t going away. Is Rugby The New Soccer For U.S. Fans, Marketers? ©2014 MediaPost Communications. All rights reserved.